Welcome to the biggest AMV contest this year! 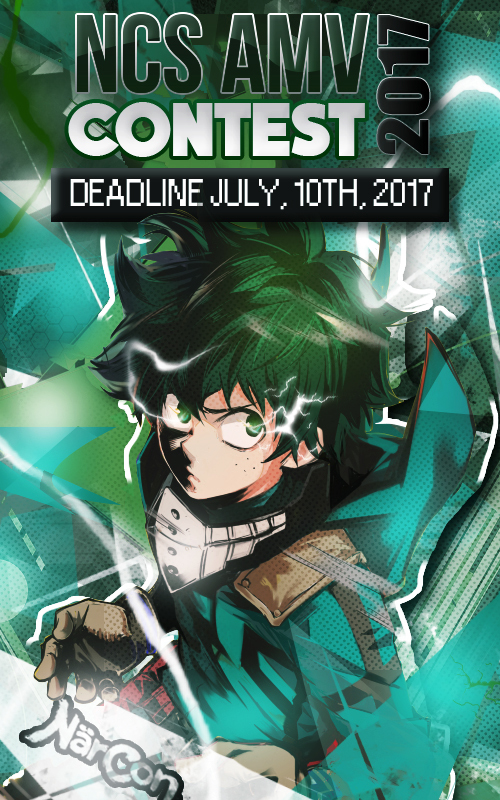 This is a new and fresh contest for those who love anime, video editing and creating cool effects in videos. So send your AMV and join the fight against other editors! The NCS AMV CONTEST has existed for a few years now but this time everyone will be able to join! NCS is the biggest convention in Scandinavia with over 10 000 visitors every year and now everyone can join the contest even if you don’t go to the convention itself! So make sure to enter and win cool prizes! • Your AMV should not have been released before the convention takes place! It has to be exclusive! #NoCheating! • AMV,GMV,MMV, MEP are allowed. #everybody, get in here! • The quality of your video and sound is important since your amv will be on a big screen in front of a big audience! We recommend that you use at least: 480p, 720p or 1080p. This is not a rule, but it will give you some extra points from the judges. • The video cannot be bigger than 500mb! • Your video cannot contain any fanmade subtitles or original credits from the source you’re using! • Upload your video through Sprend or Sendspace and send it to: ncscontest@gmail.com before July 10 2017, 23.59 GMT+2. • We will need some information from you as well: your real name, your nick/editor name, the name of your AMV, and which material you used (song and anime sources). We also need your email so we can contact you! If you are more than one editor you have to choose one editor the judges can contact. And you still have to tell us all editors in that amv. • The judges have the right to remove an amv from the contest if it doesn’t follow the rules. Amv’s recieved after the deadline won’t be able to enter the contest. • You can also join us on discord: https://discord.gg/7r87HbD to ask questions and chat with other participants! • Some cool prizes will be promised to the Judges choice and the Audience choice! • There will be 5 judges: SpeedQueen GK, Kyoroichi, Insofistikerad, Benreparn and Lawsama! • The judges will decide on 23 amvs that will be presented at the amv contest at NCS 2017! We will contact everyone before the final to let them know if their amv made it! • Every amv sent to the contest will be ranked by the judges! So even though you don't make it to the final you will still be ranked! • Ranks/placement will be posted after the final! • The final will be streamed on youtube! @ https://tinyurl.com/n7uulze , 23.30 GMT+2, July, 28th. • Reesults will be posted here: http://crowsamvteam.forumotion.com/f17-ncs-amv-contest , after the contest!